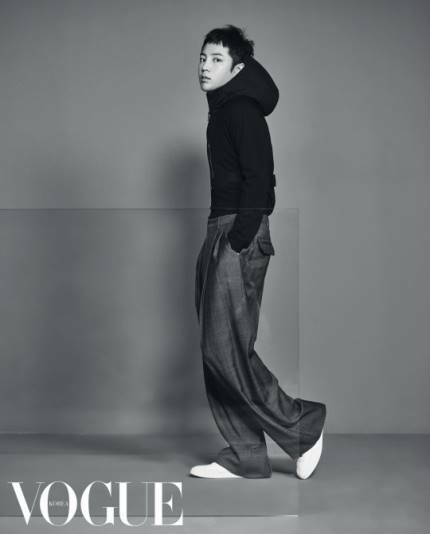 Six Korean print publications published a story about JKS' pictorial in Vogue Korea's March issue, including three of the photos. The following are excerpts from the articles, machine translated with Google Translate. "Jang Geun Suk's intense charisma, which is 100% melted in concept, is outstanding in the public picture. Especially with one eye, it emits a completely different mood for every cut, making the word "heavenly actor" appear. "In addition, it is a back door that has created an atmosphere of dramatic and drama according to costumes and accessories. His photos, which are transforming freely, are also raising expectations for the one-person two-station that will soon be shown in the drama "Switch" that is about to air." The story also includes a few of JKS' thoughts regarding working on Switch after two years since Jackpot. "These days, almost every day, before shooting the drama, I'm on all the preparations." "There is only one thing I asked for at the first meeting with the director of 'Switch' and the artist. I never saw 'Jang Geun Suk' in this drama. If you see Jang Geun Suk first than the character, I think that it is the thing that the flow of the whole drama is cloudy." It conveys the mind change to the role itself as well as the external change for the character. "In addition, "In this drama, there is a desire to act as an actor who trusts in acting," adding that his new work further awaits."